Looking for a vegan fudge recipe? This Raspberry Coconut Fudge is sugar-free and ridiculously easy to make in just under 10 minutes! A guilt-free treat that makes for the perfect healthy vegan gift for any occasion! Looking for vegan fudge recipes? This Vegan Raspberry Coconut Fudge makes for the perfect sugar-free snack to satisfy your sweet tooth! What’s not to love about fudge? Well, maybe the fact that it’s normally loaded with dairy and sugar. So when I discovered that I can actually use creamed coconut as a base for a healthy vegan fudge my world was positively rocked! This vegan fudge recipe delivers the perfect fudgy texture followed by the intense aroma of coconut, raspberry and lemon! Creamed coconut makes for the perfect sugar-free base for this vegan fudge recipe. You only need 4 ingredients making this a simple recipe. My vegan raspberry coconut fudge can be whipped up in under 10 minutes! With only 81 calories and 2 g sugar this vegan fudge is a guilt-free treat! 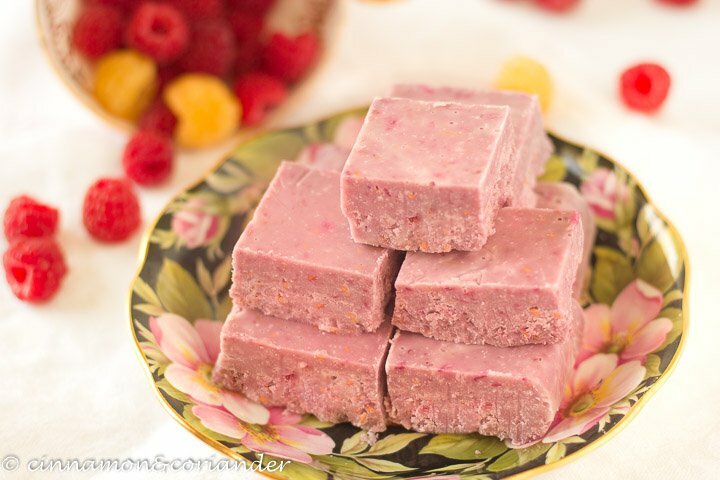 Raspberries, coconut and lemon are the perfect flavour combo for this fruity vegan fudge recipe! Raspberries, coconut and lemon are a match made in heaven. They dance and twirl on the taste buds creating an exquisite medley of flavours. In this recipe, I’ve added them to one of my all time trusted and favourite ingredients: ‘creamed coconut’, to create a decadent, soft fudge. It’s very rich, yet you needn’t feel guilty, because all of the ingredients are good for you. It’s easy to feel satiated with only one or two small squares too. They make an excellent treat or gift, and with only 4 ingredients, are quick and simple to make. Use creamed coconut as a base for this vegan fudge recipe! Creamed coconut makes for the perfect base for a dairy-free ‘fudge’. It’s naturally sweet and solidifies our vegan treat to fudgy perfection. We are not really adding any other sweetener than maple syrup, which you can also substitute with stevia! This makes it the perfect sweet recipe for clean eating plans. as it is unsweetened and organic! Which ingredients do I need for making Vegan Raspberry Coconut Fudge? How do I make Vegan Raspberry Coconut Fudge? The recipe for this vegan fudge could not be any easier! We basically chop up two blocks of creamed coconut and gently melt it over a water bath. In go the raspberries, the lemon zest and the maple syrup for extra sweetness.
. Spread this mixture into a lined loaf pan and you’re done. Congratulations! Did you break a sweat? Didn’t think so. Can I use frozen raspberries for this vegan coconut fudge recipe? Yes, you can! If you are using frozen raspberries, then you’ll need to defrost them completely before blending them with the creamed coconut. Should they still be cold, they’ll set your melted coconut before you can even blend it. You can also just toss them into the bowl when you are melting the creamed coconut. Can I use coconut butter instead of creamed coconut in this vegan fudge recipe? You sure can! Creamed coconut is pretty much the same as coconut butter ( not the same as coconut oil though). Why do I use creamed coconut here? Well, it is quite a bit cheaper to buy than coconut butter. Still, you can use them interchangeably. Is this Vegan Raspberry Coconut Fudge healthy? Is it a healthy version of regular sugary butter fudge? Absolutely! Should you eat, like, 5 in one sitting? No! There are a lot of health benefits to coconut fat. As always, moderation is key but when enjoyed in small amounts, this Rasberry Coconut Fudge can be a great addition to your diet! How do I store Vegan Fudge? You should store your healthy Raspberry Coconut Fudge cold in an airtight container. Enjoy it straight out of the freezer for a very firm treat or out of the fridge for the typical fudge texture. Use blueberries instead of raspberries for a gorgeous purple colour. Swap lemon zest for lime zest for extra freshness and zing. Add some liquid stevia instead of maple syrup. Substitute coconut butter for creamed coconut. Did you make and love this keto raspberry coconut fudge recipe? Give it your review below! ? And make sure to share your creations by tagging me on Instagram! Chop or grate your creamed coconut block. Line a loaf pan with cling film. Transfer the creamed coconut block into a small heat-proof bowl. Put the bowl in a shallow small pan or pot containing an inch or so of hot water. The heat from the water will transfer through the bowl and melt the coconut. Stir it frequently to speed up the melting process. Don’t keep it on the heat any longer than it takes to melt the creamed coconut. Once the creamed coconut has melted add the raspberries, lemon zest and maple syrup and blend everything together with an immersion blender or small food processor. To do so, you might want to transfer the mix to a taller container. Press down the blended fudge mixture into a the lined loaf tin and pop it into the fridge for a couple of hours. Alternatively, pop it into the freezer for about 20 to 30 minutes to solidify. Once firm enough, slice the raspberry coconut fudge into squares or triangles. Note: If you are using frozen raspberries, make sure to defrost them before blending otherwise they'll set your fudge mix before you get the change to blend it properly. You can always toss them into the bowl when melting the creamed coconut. You can use Sugar-free Maple Syrup or use stevia instead.